L.A. Guns got their start on Los Angeles' Sunset Strip. The band was formed in 1986 and signed with Polygram Records in 1987, recording their first album that summer. This first album, titled "L.A. Guns", went on to sell 750,000 copies and earned the band its first gold album award. Tours with AC/DC, Iron Maiden and Def Leppard followed. A compilation of the videos made from this first album also earned the band a gold video award. L.A. Guns went into the studio to record their second album, "Cocked and Loaded", in the spring of 1989. It was a hit right away with the release of "Rip and Tear" as the first single and video. "Never Enough" and "The Ballad of Jayne" followed, pushing album sales over 1,000,000 and earning the band its first platinum record award. The video compilation from this album earned the band its second gold video award. A successful world tour followed. 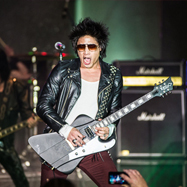 The band's third album, "Hollywood Vampires", was recorded in the fall of 1990. With the release of "Kiss My Love Goodbye" as the first single and video, and another successful world tour, the album went on to sell 700,000 copies and earned the band its third gold album award. The band went back into the studio in 1994 to start work on their next album "Vicious Circle". It was released in early 1995 and was followed by another successful world tour. Between 1996 and 1999, the band's members branched out recording and working on outside projects. In late 1999, L.A. Guns went into the studio to record a greatest hits package titled "Black Beauties" that also included five new songs written for the album. The band toured with Poison, Ratt, and others throughout the summer of 2000. In 2001, the band released its sixth studio album, "Man in the Moon". The band also changed Bass Guitarists with Adam Hamilton joining the band. A successful world tour followed. The reviews of the album were great and the band was determined to follow this up with an even stronger set of songs for the next release. L.A. Guns entered the studio for their seventh album in early 2002 with veteran producer Andy Johns, who had worked with the likes of Led Zeppelin and Van Halen , to record "Waking the Dead". The album was released in late 2002 and garnered L.A. Guns some of the best reviews the band had ever received. 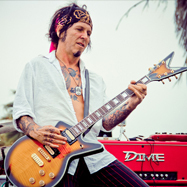 It was also when Tracii Guns decided to quit the band to do "Brides Of Destruction" with Nikki Sixx. That same year, L.A. Guns acquired Stacey Blades to handle the guitar slot. Blades had been around the L.A. music scene for many years recording and playing lead guitar in both Roxx Gang, Supercool & S.M.A.C.K. He fit the bill perfectly, coming from the same school of rock that L.A. Guns are from. When the US tour to support "Waking the Dead" ended, Tracii announced that he was "officially" leaving L.A. Guns. The band continued to tour despite his untimely departure. After a 2003 world tour to support "Waking the Dead", L.A. Guns went into the studio in January of 2004 to record "Rips the Covers Off" with producer Andy Johns. This was a collection of 70's rock songs. Once again, the band went on a full world tour to support the new CD. In May of 2005, L.A. 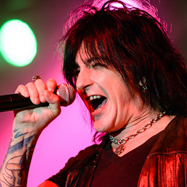 Guns began work on "Tales from the Strip" with Andy Johns again producing. The "Tales" CD was released August 2005. Reviews were great with many saying it was some of the best music out today. L.A. 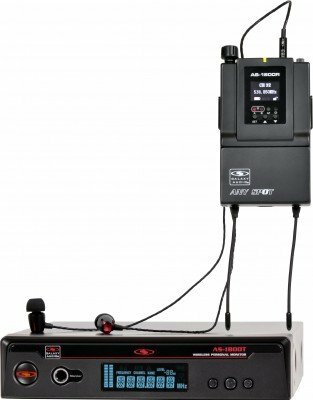 Guns hooked up with WASP for an early summer through September tour. In early 2006, L.A. 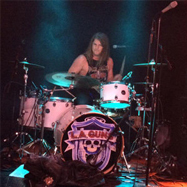 Guns did some local L.A. shows and recorded them for a new live CD. This new live CD, "Loud and Dangerous", was released late August 2006 with the band again supporting it with a world tour. In Early 2007 long time Bassist Adam Hamilton decided to do song writing and producing full time. The guys acquired Hollywood Veteran Scotty Griffin, but in Mid 2009 Griffin left the band to do a residency in Las Vegas. Kenny Kweens from Beautiful Creatures quickly came aboard as the new bass guitarist. 2011 sparked the triumphant return of Scotty Griffin on Bass. In November 2011 the band signed their latest record deal with Cleopatra Records, releasing their tenth studio album "Hollywood Forever" in June 2012. The album was produced once again by veteran music producer, Andy Johns. The new record debuted at #25 on the Billboard Rock charts with the title track "Hollywood Forever", and it was considered one of the best Hard Rock albums of 2012 by fans and critics alike, proving once again that L.A. Guns were on top of their game with additional tracks "You Better Not Love Me" and "Sweet Mystery". In December 2012, guitarist Stacey Blades announced his departure after serving the band for almost ten years, to follow a different musical direction. In January 2013, the talented guitarist Michael Grant - frontman of his own band, EndeverafteR - crossed paths with singer Phil Lewis. His dynamic performance complimented Guns’ raw rock n’ roll energy, and he hit the ground running as the new lead guitarist. 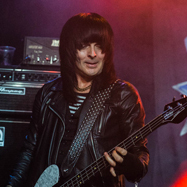 In September of 2014, Kenny Kweens replaced Scotty Griffin as the band's bassist. With more than 25 years' worth of noteworthy material, the band have proved to be true warriors of the 80's genre and are geared to tear it up across the world giving audiences the high octane Rock-n-Roll that is L.A. Guns.